I have a question for you, but I think you’ll need a little background information first. And bare with me, because I’m not sure how well I’ll be able to explain all of this. Credits to Wikipedia for this wonderful diagram. 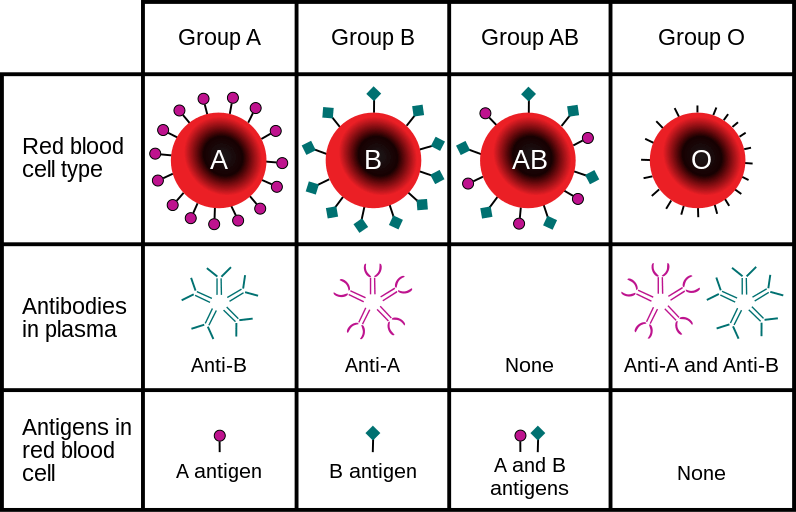 There are 4 blood types (plus the whole negative/positive thing, but I haven’t learned that yet), each with different marker proteins and different antibodies. The marker proteins tell the rest of the body what type of cell each blood cell is, and these markers are called antigens. Type A blood has A antigens, B has B antigens, AB has both A and B antigens, and type O blood has no antigens. Blood also has antibodies, which fight off certain cells. Type A has anti-B antibodies, so it essentially kills off all of the type B blood. Type B has anti-A, type O has anti-A and anti-B, and type AB has neither anti-A or -B. After learning all about compatibility in blood types, our teacher explained that type O is the universal donor, and type AB is the universal receiver. Someone with type AB blood can accept any other type of blood, and anyone is able to receive type O blood. So finally, here’s my question: would you rather have type O or type AB? Would you rather be the universal donor, or the universal receiver? Would you rather help or be helped?